1 "There's a robber in the house!" shouted Dot. "A robber took my soccer sock. I had two soccer socks yesterday, and now I have only one. I know there's a sock robber in the house." 2 Dot looked everywhere for her sock. It wasn't in the hall. It wasn't on top of the wash. Was it in the closet? 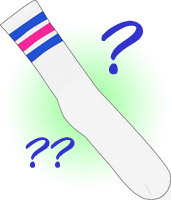 Where did she leave her sock? Dot asked her mom to help her find her sock. 3 Mom said she was sure there was a sock robber in the house, too. "That sock robber took your brother Bob's socks, too," said Mom. "Funny thing is that awful sock robber always takes only one sock." 4 Dot and Mom looked for the sock. They started in the sock drawer. They looked on the floor behind the drawer. They looked under the bed. They looked in the closet. They did not find her sock. 5 Mom got Dot some of Bob's socks. "Try these socks for now. We will look for your soccer socks after the game."